Submitted photo Richard Knisley displays his new Ohio record hybrid striped bass. WASHINGTON CH. — A new Ohio record Hybrid Striped Bass — a cross between a white bass and a striped bass — has been certified by the Outdoor Writers of Ohio State Record Fish Committee. The new state record hybrid striper, weighing 18.32 pounds, was caught by Richard A. Knisley of Washington Court House in a feeder creek to Deer Creek Lake in Fayette County. Knisley caught the hybrid striped bass May 24 using cut shad for bait, on a spinning rod with 15-pound test monofilament line. Knisley’s hybrid striped bass is 31.75 inches long and 24.5 inches in girth. 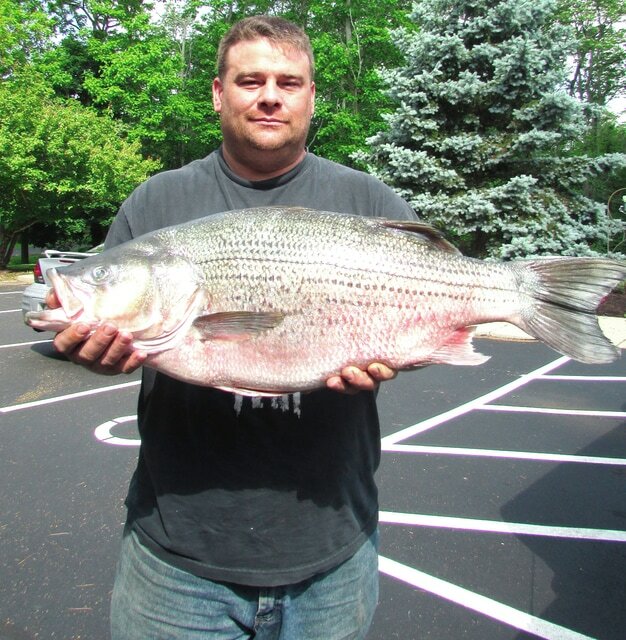 His catch replaces the previous state record hybrid striper which was caught in Deer Creek Lake by Rosemary Shaver on May 4, 2001, weighing 17.68 pounds and measuring 31 inches long. Ohio’s record fish are determined on the basis of weight only. Ohio’s state record fish are certified by the Outdoor Writers of Ohio State Record Fish Committee with assistance from fisheries biologists with the Ohio Division of Wildlife. Fish Management Supervisor Debra Walters from the Ohio Division of Wildlife District Five Office in Xenia confirmed the identification of Knisley’s catch as a hybrid striped bass. For more information on Ohio’s state record fish program contact Fred Snyder, Chairman, OWO State Record Fish Committee, 754 Co. Rd. 126, Fremont, OH 43420, phone 419-332-0777, email fnsnyder@gmail.com, www.outdoorwritersofohio.org.